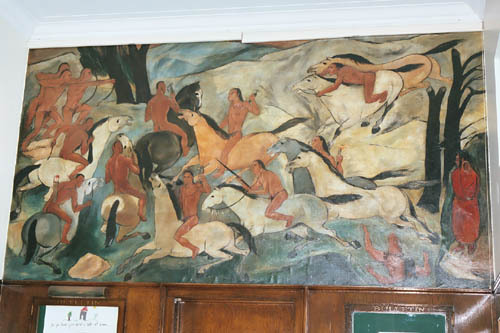 The mural in the lobby of the Oglesby, Illinois post office was painted by Fay E. Davis of Chicago in 1942 under the Treasury Department Section of Painting and Sculpture. The cost was $700. 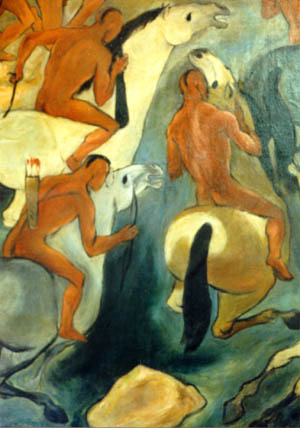 It is an oil on canvas entitled "Illini and Potowatomies Struggle at Starved Rock". It is 12'5" x 6'9" and was refurbished in 1988. 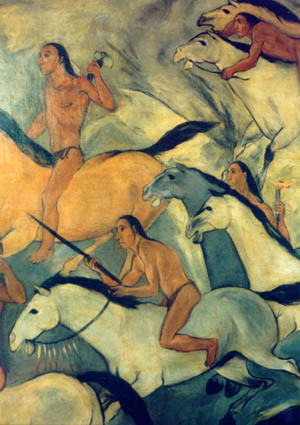 The mural is currently on display during hours the post office lobby is open. "Illini and Potowatomies Struggle at Starved Rock"
Special thanks to Tina Katkus for her help in researching the Oglesby, Illinois mural.